Online shopping may be killing the retail sector, but it will be a huge benefit to Sonoco Products. Here's why you might want to buy it. The retail apocalypse is a huge deal for brick-and-mortar stores, even if the pain doesn't turn out to be as bad as some hyperbolic market watchers suggest. The main issue, of course, is the growing importance of online sales. But what if you could find a company that wasn't as prohibitively expensive as many tech stocks and was set to benefit from e-commerce growth? That would be little-known Sonoco Products Company (NYSE:SON). Here's what you need to know about this 2.9%-yielding industrial stock. Sonoco, a company over 100 years old, makes packaging, a notably unexciting industrial product. The actual list of packaging it creates is fairly broad. However, a key product category is consumer packaging to hold goods sold both in stores and online, and protective products like boxes and internal packaging components. Such products accounted for 53% of 2017 sales, combined, and are the largest piece of Sonoco's business. It also produces the cardboard displays you see in stores (10% of sales) and industrial products like bulk papers and cardboard spools (37%). Here's the thing. As retailers and consumer good companies look to protect their place in the retail landscape, they are increasingly looking toward innovation on the packaging front. For example, in the grocery space that means more fresh products that need the special packaging that Sonoco can offer. That includes everything from clear egg cartons to flexible plastic bags to hold fruits and vegetables. Of course such packaging is used regardless of whether you buy from the store or order your groceries online -- Sonoco benefits no matter how the products are sold. Consumer goods companies, meanwhile, are looking to contain costs and increase brand visibility. Once again Sonoco has that covered, with things like squeeze bottles for sour cream and innovative and bright packaging to refresh old brands. Again, it doesn't matter if these good are sold online or offline. Cardboard displays, meanwhile, are a way for retailers to keep their stores exciting while highlighting products for sale in an effort to keep customers coming back. Which is why consumer good companies like them, too. It's a small business, but important nonetheless. And, perhaps most obvious, the protective products group makes the boxes and internal packaging components that keep products like high-tech televisions safe while they are transported around the country. These packaging components are needed whether that TV is bought in a store or from a website. Data source: Sonoco Products Company. The real proof of the demand for Sonoco's services, however, shows up in the company's financial results. Base earnings per share, which pulls out one-time items, have increased in each of the last five years. The company's ability to serve both brick-and-mortar stores and online retailers is a key reason why this pick-and-shovel play hasn't suffered along with the the troubled retail sector, which has seen many once proud stores succumb to bankruptcy (Bon-Ton and Toys R Us are just two recent examples). The dividend, meanwhile, has been increased for 36 consecutive years, with a mid-single-digit compound annual growth rate over the trailing three-, five-, and 10-year periods. Is it worth buying today? The problem with Sonoco is price. The company's price-to-earnings ratio is around 23 today, compared to a five-year average of 20 or so. It is also a little pricey when you look at the price-to-sales, price-to-cash flow, and price-to-book value ratios. The company's price-to-earnings-to-growth ratio, also known as the PEG ratio (this ratio compares P/E to a company's growth rate), is also elevated, sitting at around 3.4 compared to a five-year average of 2.7. That suggests that investors are paying a premium price for Sonoco's potential growth today. 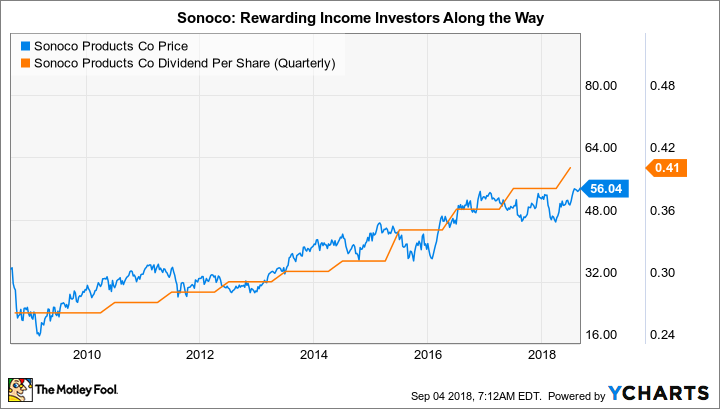 However, if you are looking for a way to benefit from the switch toward online sales without taking on the valuation extremes in the tech sector, then Sonoco might still be a good fit for your portfolio. For example, online giant Amazon.com's P/E is a massive 159. That's hard to justify if you pay any attention to valuation. And Sonoco's outlook could be brighter than expected if it continues to expand via acquisition, which has been a key tool in recent years. Acquisitions like Clear Lam, Plastic Packaging, and PrimaPak have brought with them many of the new products that Sonoco is leveraging into earnings growth today. Sonoco isn't a slam dunk investment by any stretch of the imagination. That said, a generous yield backed by a strong business that will benefit from the changes now rippling through the retail sector makes it an interesting alternative to the high-priced tech names that are causing so much disruption. It's like selling picks and shovels to gold miners: Sonoco wins no matter what happens.